Happy Holidays to All of Our Customers! Save 50% on These Overstocked Christmas Ornaments! Under $10 after the special discount. 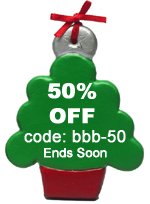 This Exclusive Code BBB-50 must be used as checkout for the saving. Get the Best Ornaments Today for Happy Holidays or Too Late! Build a Beary Huge Hug for Parents or Grandparents from the Whole Family.